As I work through plans on how to combine two grades. And am now ready to begin. When last did you say yes to a new experience? I’ll never forget the first time I said ‘yes’ to a new age group when I was teaching. But it was the second time I said ‘yes’ to a new group that made its mark on me indelibly. I had always taught high school — and occasionally a class or two in the junior high level when I taught for a private school that had both units on the same campus. At that time, the junior high was only 7th and 8th grades, and they functioned exactly like the high school classes. Then I had to step out of teaching for a couple years due to my husbands failing health and his need for constant care. When I went back, the principal asked me if I would consider taking the 6th grade class, which at that time was totally self-contained and operated like the elementary (No changing classes or teachers; I taught every subject). They needed a teacher with lots of experience for that class, and they wanted me, but I was very hesitant. Finally, I agreed, and I have to say that it turned out to be a very, very enjoyable experience. I was never sorry that I had made the switch — although I had always enjoyed teaching high school thoroughly. Then I moved, and when I went looking for a job, I applied at a school that had an 8th grade position open and a 2nd grade position open. The principal talked with me and agreed that I was about the most qualified applicant for the 8th grade position, but then he surprised me by asking me to consider taking the 2nd grade instead. Again, they wanted a teacher with lots of experience, and I was the one applicant with years of teaching experience behind me. I wrestled with the decision, but finally decided it was time for another change in my life. But I had never considered teaching young children a strong area for me, and I worked fiendishly studying the curriculum and preparing myself. At first, I think I tried TOO HARD to follow the very exacting teacher’s manual. And I have to admit that I cried a lot the first two weeks. (Only after I got home, of course.) But at the end of that period, I realized that the reason the principal had wanted me for the class was because of my experience, and that I needed to forget about “following the book to the letter” and let my experience take over. Once I did that, I began to relax and get back my old love of teaching. Those kids responded beautifully, and it became a real love affair between us. I loved that year, and it changed my life. I still often see some of the students that I had that year. They are grown now — into their early 20’s — but they still remember me and still love me. It’s a wonderful lesson in how good change can be. Now I teach college classes. Life is so wonderfully full of changes, and I believe they are part of what helps us stay young and in love with life. I hope you have a delightfully rewarding experience with your change this year. What a beautiful experience Sandra and thank you so much for sharing it with us. You took such a brave step to move from high school teaching to the primary grades (as I did as well). It sounds like your bravery in saying yes brought about a positive experience not only for you but for your students as well. That is a scary yes – and one that I am toying with myself. Kudos to you for taking the step. I would be interested in reading of your progress. Love your willingness to be open to new things and experiences. 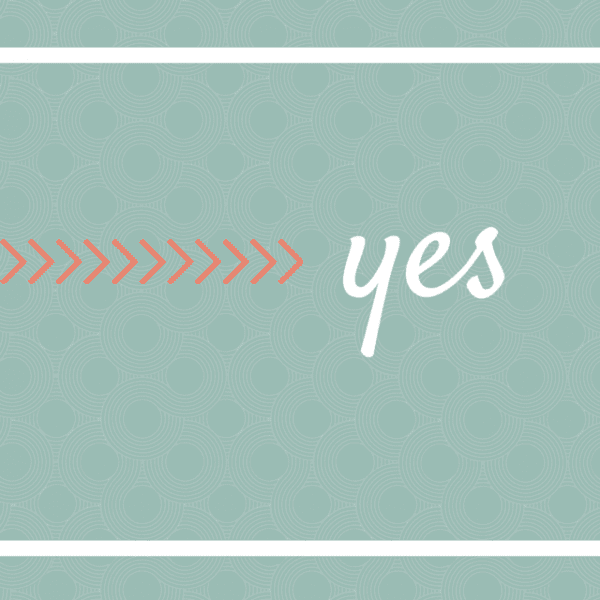 I remember blogging as my big “yes” and it’s truly been a blessing. What starts out as scary eventually turns into a blessing. Thanks for sharing! I felt that way about blogging too. It was scary at first putting one’s thoughts out there – and it certainly got easier as time went by. Your kids are so lucky to have you as their teacher! Sounds like you have a wonderful year ahead. I try to make it the best experience for all of us. Congratulations! It is only by saying ‘Yes” that we can be open to the possibilities that await. I think of all the changes I have seen throughout my life and all the changes I have accepted, and those I have chased. Change is what keeps us alive. Learning is change. I read a book when my daughter was young called “What would happen if I said, “Yes’?” It was a book about parenting and the fact that a first response can often be “No”. This book questioned the alternative, not necessarily saying yes immediately, but maybe ‘Yes, when …” It helped change my perspective and helped me to pause, and think, before responding. I wish you a wonderful time as grow into. explore and learn from this new adventure. I do look forward to hearing about it. Sounds like a positive book and one that can be applied not only for parenting. Once your are in the thick of it, you won’t have a moment to think about your having accepted this new challenge. You’ll just do it and the rewards will be many. When she is older you will have time to yourself again. In the meantime, enjoy the moments you spend with her. They grow up too quickly. It can be scary to say yes. But you read about my yes to God on Heart Choices. I loved reading your take on YES for FMF. A person always does – especially when the experience is challenging and invigorating. So happy for you. Looking forward to hearing more about your class and how combining two grades is working out.